At Arch Enterprises we have a wide variety of equipment to handle both large and small customer requests. For example, we have multiple large-scale R4-B rotary furnaces and thermal oxidation units to handle silver-bearing material from industrial customers. Additionally, we have smaller furnaces and an electrolytic bath laboratory to refine gold, silver, and platinum. 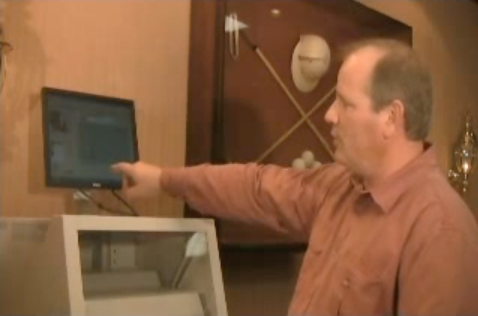 Owner Jim L. using our XRF Analytical Machine at a recent event. We also have the capability to perform in-house analytical tests with an XRF Analytical Machine. This technology is used to pinpoint the amount of precious metal available in an item without causing any damage to the material. The XRF Analytical Machine accounts for 100% of the metals in an item. We employ state-of-the-art security technology and we are in compliance with all federal, state, and local environmental regulations. Check out the XRF Analytical Machine in action on the Arch YouTube Channel!